When we were little, my sister and I used to play bath shop, a game which involved taking all of the lotions and nail polishes around the house, blending them into new concoctions and re-selling them to our mom. So naturally my love for homemade beauty products kicked in when I came across Grace & Ivy’s blog and beauty goods. I’m REALLY excited to have Ivy sharing her tips and a DIY recipe with us today. It’s like playing bath shop…only better! An artist at heart, I was an interior designer before mommy-hood and got my BFA at the Ringling School of Art and Design in Sarasota. Creating things – whether a room, a meal, or a painting – is something I thrive on. I began the adventure of making my own products in the third year of being a stay-at-home mom. I loved being with my daughter but my brain craved a new challenge. Nap time and the rainy afternoons in Portland gave me the perfect opportunity to explore a new endeavor. When I became interested in creating my own line of skin care products, my husband encouraged me and so began my in-depth research on just how I was going to do that. 2. What made you decide to start your own business and how did you get it going? I began looking into product ingredients after reading the back of a baby lotion bottle one day. Suspicious of all the ingredients I couldn’t identify, let alone pronounce, I began researching and was horrified by all the petrochemicals and preservatives I was slathering on my daughter…and myself. 3. 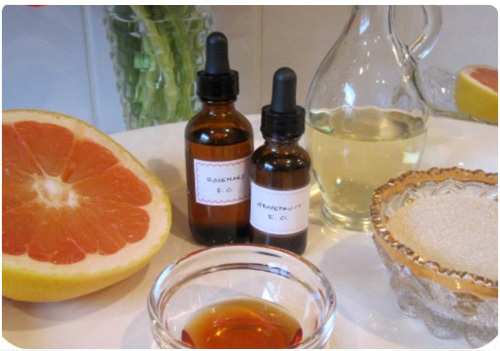 What is your favorite “ingredient” to use when making DIY beauty goods? 4. What are 3 beauty products that you couldn’t live without? Three constant stars in my beauty regimen are my oat and honey cleanser (yes more honey), my oat and herb scrub and my green tea night cream. The cleanser is pure and simple and leaves my skin feeling soft and cleans. The oat scrub, I use once a week, to gently exfoliate and the green tea night cream always soothes my skin, which gets pretty dry by the end of the day. 5. “Going green/organic” is a popular topic with home and beauty products these days. For someone looking to start making the switch to natural products, what would be the first items you would recommend that they swap out? I would start with the products you use the most on your skin. The ones you leave on, like moisturizers and makeup. These products are readily absorbed into the body, thus seeping toxins in. As for home cleaning…check out my simple recipes for an all purpose counter/glass cleaner and my favorite dishwashing detergent. They cost pennies to make and reduce toxins in our water and air. 6. HAP blogger Stef is a new mom and you have a little one of your own. What kinds of products work best for babies and their sensitive (and soft!!) skin? Will you be doing a baby line or are your products already baby-safe? A baby’s skin is highly sensitive and very delicate, so pure, simple products should be used. Avoid mineral oils, petroleum jelly and synthetically scented products. I recently read that babies in this country are born with more than 200 toxins in their bloodstream, most of which have been passed through the mother via pollution, processed foods, medications, over-eating, cellular waste, and stress. Yikes! Why would we want to add to this? Grace & Ivy is preparing to launch our Baby line this Spring. It will feature a Lavender & Chamomile baby wash and Baby lotion among other items, which are safe and relaxing for baby. I’m really excited about this line and love using these on myself and my daughter. 7. Some of your combos sound so delicious…do you ever have to restrain from sneaking a taste of your products? With the warmer months ahead, it’s a great time to start rejuvenating your skin. I like to use a sugar scrub for this very reason. Grapefruit and rosemary essential oils help refine, detox and relieve congestion in the skin, creating a smoother appearance. 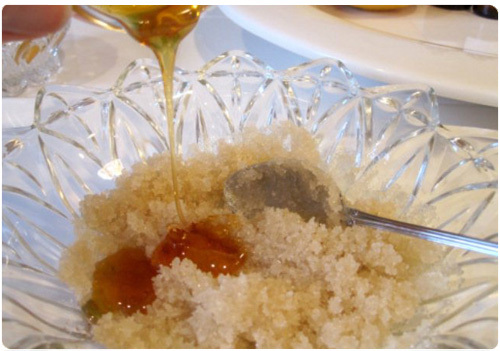 The sugar is a natural exfoliate and the honey is a great humectant, which helps retain moisture. I use sweet almond oil for this recipe but you could substitute it with jojoba, olive or even avocado oil. **If pregnant do not add the rosemary essential oil, instead replace with lavender. To the sugar slowly add the oil, mixing to a consistency you like. You may need less or more oil depending on what texture you prefer. I aim for a paste like consistency. Add the honey and mix thoroughly. Lastly add the essential oils and give a final stir. 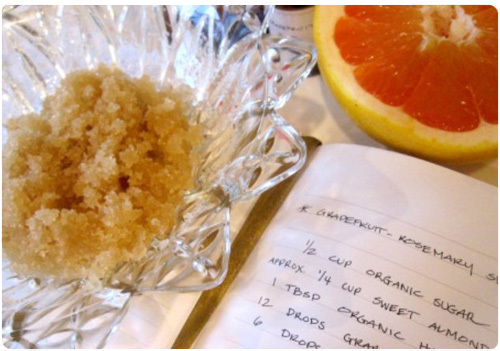 This will provide enough sugar scrub for 1-2 applications. Store the scrub in an airtight container in your fridge. It should last a week. Stir up before use and use caution – the oil may make your tub/shower slick. The result: Super smooth, soft and glowing skin! LOVE!!! Thanks for sharing! Being the sister Katie refers to above…I am super excited to play bath shop again, only with actual recipes! Thanks again for letting me share a recipe with your fabulous blog readers! So much fun! Have a fantastic weekend!! I too just love homemade beauty products. I thought pregnant women had to stay away from Lavender essential oil too? Actually lavender is considered safe for pregnant women…check out more safe oils for pregnant women here..
after the new moddel makes its appearance.